Ida Mett (born Ida Gilman, 20 July 1901 in Smarhoń, Imperial Russia – 27 June 1973 in Paris, France) was a Belarusian-born anarchist and author. Mett was an active participant in the Russian anarchist movement in Moscow, and was arrested by Soviet authorities for subversive activities and escaped soon thereafter. From Russia, she fled to Poland, later Berlin, and eventually to Paris (1926) where she became active with Dielo Trouda Group and co-edited the Dielo Truda magazine. Mett wrote The Kronstadt Commune, a history of the rebellion at Kronstadt, in 1948. Published by the Spartacus publishing house, it subsequently re-awakened controversy over the events. She also authored The Russian Peasant in the Revolution and Post Revolution (1968) and contributed to various international periodicals. She died in Paris on 27 June 1973. 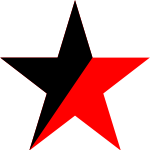 Revolutionary Confederation of Anarcho-Syndicalists "N. I. Makhno"